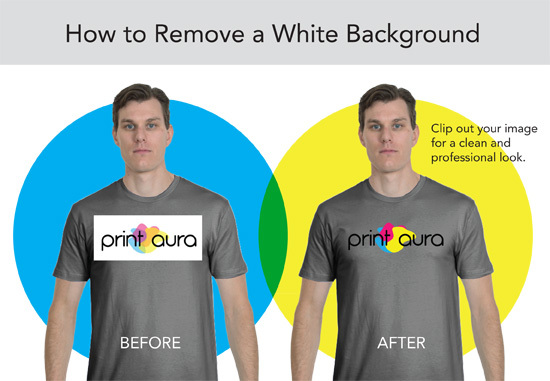 When designing a t-shirt, hang tag or heat press label you often will have a logo or graphic that is on background. If you want your graphic to ‘POP’ on the shirt, you must remove this background and place the object on a transparent background. In this tutorial we will show you a few ways that you can easily remove the background and place the image on a transparent background that will make your designs look professional and amazing! Getting rid of the white background on your image is now easier than ever for the novice. In fact, no design training is even necessary these days. There are several programs that you can use to achieve the same result. Choosing the right program depends on your skill level, computer platform, and budget. Below are a list of free and pay programs that can be used to remove any background from an image. Don’t want to do it yourself? Consider posting a project on Fiverr, it may cost you as little as $5. Here are some services that do background removal. As you can see, you don’t have to be a design professional with years of experience to achieve the quality results that you are looking for. And now you are one step closer to creating great graphics and improving the quality of your brand. If you have any suggestions for other readers or have questions on any of these programs, leave a comment below!